Bath Abbey (more properly the Abbey Church of St. Peter and St. Paul) is a massive late Medieval church in the heart of Bath. Built of warm yellow Bath stone, the front entrance to the church opens out onto a pedestrian plaza that also includes the Roman Baths and the Pump Room. At least three churches have been built on this site. In 757 A.D. An abbey church was built here as part of a monastery that was the successor to a convent founded here in 675. When the Normans conquered England in the 11th century, they tore down the old church in order to make way for a massive cathedral. Eventually, that cathedral fell into disrepair and it was replaced by the somewhat smaller church that we see today. It dates from 1499. 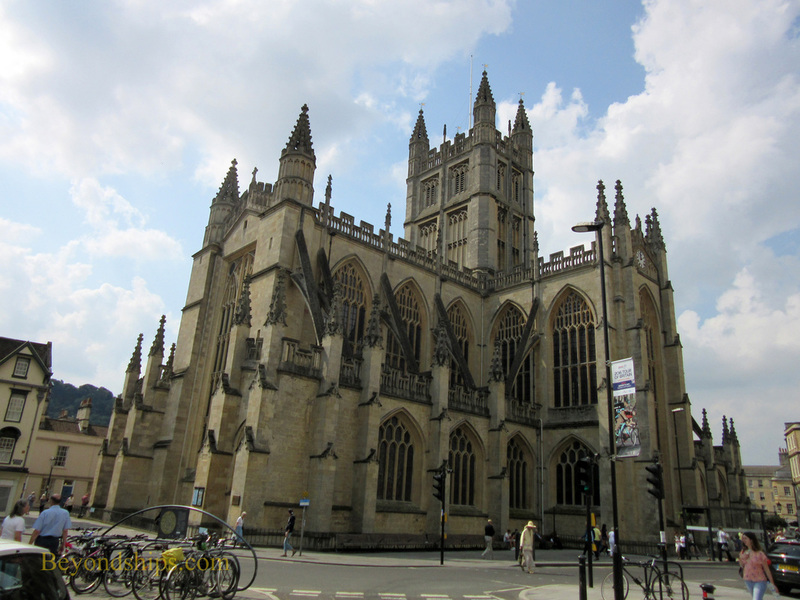 Until 1539, the church was also a monastic church, part of the Bath monastery. In that year, however, King Henry VIII dissolved the monasteries in England as part of the Reformation. As a result, the recently completed third church was stripped of its valuables and allowed to fall into disrepair. 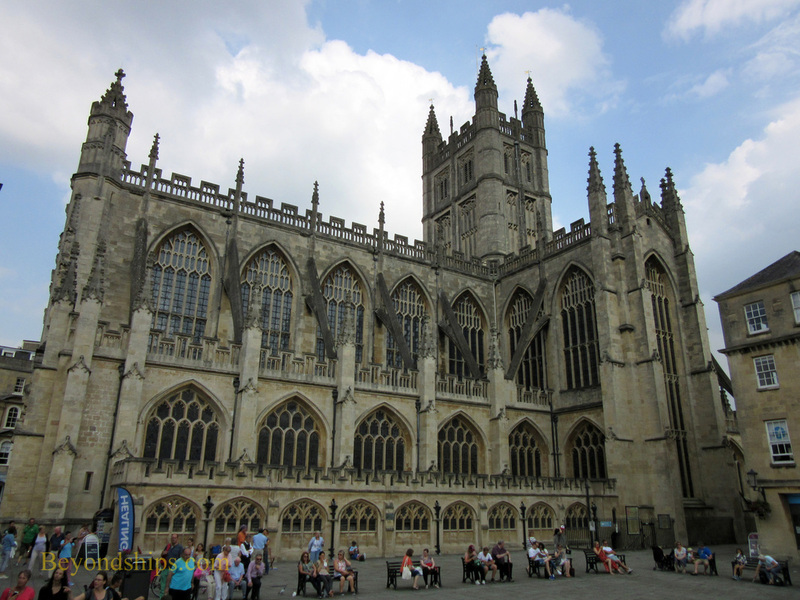 It was not until Queen Elizabeth I decreed in 1583 that Bath Abbey would become the parish church for Bath that the church's fortunes started to improve. However, the restoration work was not completed until 1618. 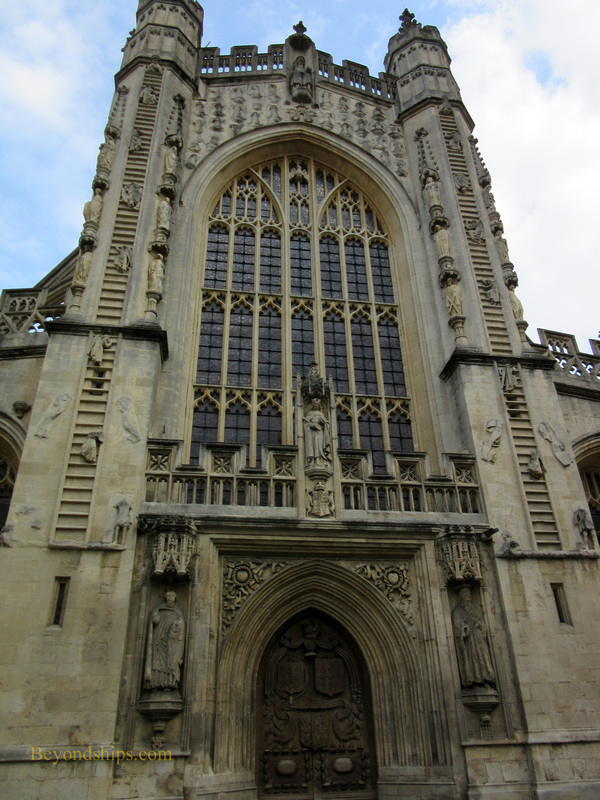 As the local parish church, Bath Abbey was patronized by the rich and fashionable who visited Bath during the Georgian period. But by the 19th century, work was again needed. In the 1820s, shops and other structures that had sprung up around the Abbey were removed. During the next decade, architect George Manners added new buttresses outside and new galleries inside. And in the 1860s, Sir George Gilbert Scott oversaw extensive restoration work. Today, Bath Abbey continues to be a local parish church with religious services taking place throughout the week. At the same time, it plays host to some 420,000 visitors each year. The church is an example of the Perpendicular form of Gothic architecture. About 80 percent of the wall space is taken up with stained glass windows allowing in lots of natural light.. Buttresses provide support to the walls and roof. In addition the fine fan vaulting is not merely ornamental but also provides support. An unusual feature of the exterior is the sculptures of angels climbing up ladders on the West Front by the main entrance. Oliver King, the Bishop of Bath in the 15th century, is said to have had a dream of angels ascending into and descending from heaven. The dream supposedly inspired him to tear down the ruined Norman cathedral and build the current church. Atop Bath Abbey is an oblong-shaped tower. It rises 161 feet (49 meters). From the top, there are panoramic views over the surrounding city. However, there are 212 steps to get there. The Abbey offers tours of the church and of the tower. There is a shop and a museum. Visitors are asked to make a donation in lieu of an admission charge. Above: The distinctive West Front with its sculptures of angels climbing ladders to heaven. Below: Inside there are contemporary sculptures of angels playing musical instruments. Above: Delicate-looking fine fan vaulting also provides structural support. 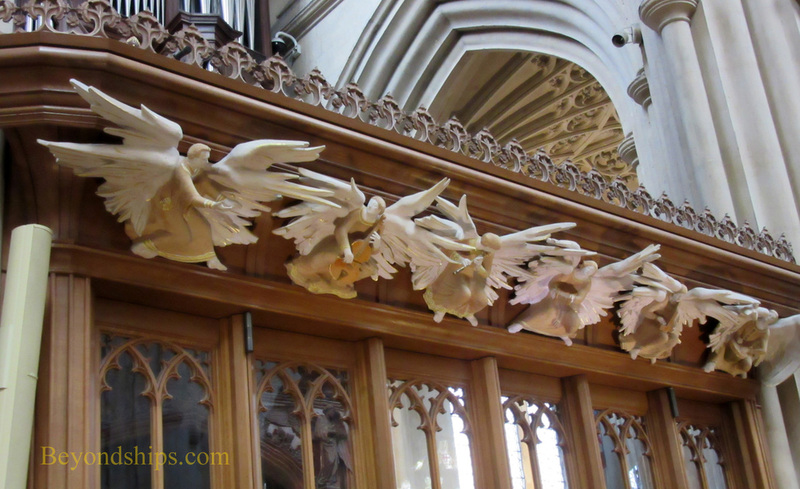 Below: Scenes from Bath Abbey.